First PMKF Boston Roundtable Great Success! Our first PMKF Community Roundtable facilitated by Community Organizer Nicole Perryman was held on Friday at the Mattahunt Community Center in Mattapan. Panelists included Marie St. Fleur (Bessie Tartt Wilson Initiative for Children), Kymberly Byrd (Vital Village Network), Barbara Pierre (Mattahunt Community Center) and Laura Williams (Family Child Care). Stay tuned for information on our next meeting! “The average preschool teacher in Massachusetts earns just $25,500 a year. As a result, turnover in the field is high — around 30 percent each year. Education advocates are asking lawmakers to override Gov. Charlie Baker’s veto of $7.5 million for salary increases for preschool teachers who serve low-income children. The request comes as lawmakers prepare to take up $256 million in line item vetoes that Baker made to the fiscal year 2017 state budget. Requests from early educators will compete with requests from nursing home workers and from artists. 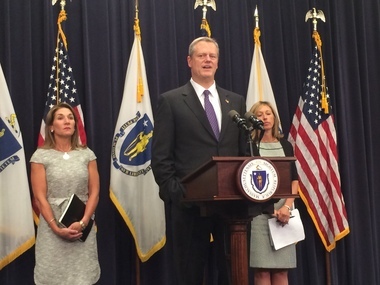 In early education, Baker vetoed $7.5 million for the salary increases, $9 million from the general childcare budget and another $1.3 million from several line items, including a child literacy nonprofit and a family mentoring pilot program. Administration officials say the $9 million is money that education officials believe they can cut through “caseload reductions” without impacting core services. Officials point out that the early educators will still get a salary increase, just not as large of a raise. Baker on Friday signed a $38.92 billion budget into law for fiscal 2017. Local projects, tourism spending, and state employees paying for their health insurance will all feel the squeeze of his vetoes. But advocates for the schools say the money is necessary. For the average teacher, Eddy said the salary increase would be around $850 a year, to $26,300. With the cut, the average teacher would get an annual raise of around $340. “It’s not going to make a quality of life difference for our educators,” Eddy said. Eddy said when teachers are not paid a reasonable wage, there is constant turnover, which hurts the quality of education. “The key for us is keeping and retaining qualified and credentialed staff,” Eddy said. The students served by state and federally subsidized preschool come from low-income families, families transitioning off welfare and children in state custody due to abuse or neglect. Advocates say it is not clear exactly what the impacts will be of the additional $9 million cut. “Already, we can’t serve the children who qualify for assistance … and obviously cutting $9 million from the pot of money that’s not getting the job done now doesn’t make the job easier,” said Nathan Proctor, state director of Massachusetts Fair Share, a group that supports raising taxes to support additional investment in education. Massachusetts Fair Share circulated an online petition, which has gotten more than 1,100 signatures, asking legislators to override Baker’s early education budget vetoes. BOSTON – Community members have expressed frustration in response to Governor Charlie Baker vetoing $17.5 million in funding to early education, including a much needed $7.5 million to the struggling workforce. A petition that has garnered over 800 supporters in just the last 2 days from across the state will be delivered to The Massachusetts State House and State Senate in an effort to push legislators to override Gov. Baker’s targeted line item cuts to early education funding. Since 2001, early education and out-of-school-time programs have lost more than $148 million in state funding (adjusting for inflation). There were modest gains in the budget around early education funding, but those gains are in jeopardy. “We can do better. Every child deserves the same strong start,” added Proctor. Marie St. Fleur, President and CEO of Bessie Tartt Wilson Initiative for Children (BTWIC), has announced that she will retire from the post in November 2016, following three years leading the Initiative. The BTWIC Board of Trustees has established a search committee to lead a timely recruitment process for St. Fleur’s successor. The Committee is comprised of sitting Trustees and is headed by the Chair of the Governance Committee, Debbie Smith. BTWIC is well-positioned for this leadership transition. It is an emerging organization that has demonstrated capacity to successfully manage a transition beyond its Founder Mary Reed, who skillfully led the organization for over a decade. It enjoys a strong reputation for excellence in grassroots research and community engagement with a robust community partnership portfolio. Marie St. Fleur expects to remain actively engaged throughout the transition and BTWIC’s staff and Board are committed to a smooth search process and transition. The search process has launched. The Board has retained Executive Service Corps (ESC) of New England to manage the process. Research Activities: To support increasing the quality of early education and care for all children, BTWIC launched the report Eating to Learn and facilitated expanded access to nutritious snacks and meals through the Child and Adult Food Program for over 900 children. To support the approximately 60% of children under 5 who are in unlicensed care, BTWIC’s research on Family, Friend, and Neighbor Care highlights the need to focus on this diverse population of caregivers and identify recommendations that can connect them to systems of developmentally-appropriate resources. Technical Business Support for providers: BTWIC launched a small business innovation center providing contextualized technology and business training, allowing early education and care small business owners to develop and use a budget, create a business plan, and utilize a marketing strategy all while reducing the digital divide. The early education workforce in Massachusetts is 96% women – often women color and English language learners – and the median salary level is approximately $25K a year. Advocacy for the Profession: BTWIC has grown and strengthened advocacy for greater investment in quality early education and care that is anchored in the workforce. It launched a multi-sectoral early education and out-of-school time coalition that has over 75 member organizations with outreach capacity to over 10K Massachusetts residents. This coalition, the Put MA Kids First coalition, has built a strong grassroots presence as well as an effective social media presence that has yielded consistent state increases in direct workforce support for two fiscal years, from $9M to $17M. Financial Position: Like many small research-based nonprofits, BTWIC is on a consistent path to strengthen its donor base. Transitioning from a dedicated founder receiving a part-time salary to its first non-founding President and CEO, over the past three years BTWIC has consistently met is expenses. All of its account receivables are current. In Fiscal Year 2016 it raised over $650K and is starting FY2017 with $250K in pledged revenue. BOSTON – Massachusetts Fair Share, a statewide grassroots advocacy organization with thousands of members across the state, issued the following statement about news of the 2017 final budget. The budget, passed out of the conference committee today, included critical investments in early education: a $12.5 million investment (1599-0042) in increased compensation for early educators and a $2 million boost to a program (3000-1020) to help early education providers increase and maintain their level of quality. “With this budget, state lawmakers have shown us that they understand just how important early education is. Even while facing a significant budget gap, we are making real progress. “Massachusetts should lead on education, but when it comes to early education we have been lagging. For years, Massachusetts’ funding for early education and care has not kept pace with inflation, resulting in a reduction of more than $100 million. It’s a welcome sign to see that trend turn around. “Studies establish the necessity of quality in order to see long-term positive impacts in early education, but declining budgets have undermined quality. We’re struggling to keep dedicated and highly skilled educators in the field, and face a 30% turnover rate. Stabilizing the workforce is the best way we can help more children get a strong start. The investment of $12.5 million in educators is evidence that our state’s leaders understand that. Statement attributable to Massachusetts Fair Share Director Nathan Proctor. FY17 MA Budget Doubles Investment in Early Ed! Well Done PMKF Coalition Members and Supporters! The Put MA Kids First Coalition is proud to announce that the legislature approved the FY17 budget today which includes $12.5M for the rate reserve and $2M for direct grants to programs who are actively engaged in efforts to enhance quality by achieving level 3 and 4 in the QRIS. The Coalition’s letters, calls, and advocacy have made a difference, more than doubling the FY16 investment of $5M for the rate reserve and $1M for quality improvements! THANK YOU to Speaker DeLeo, Chairman Dempsey, Chairwoman Peisch, and all the members of the Conference Committee for championing quality in early education and care and out-of-school time (EEC-OST) programs in the FY’17 budget despite a $750M revenue shortfall and cutting more than $413M in proposed spending from budget bills agreed to in April and May. We also want to give a big THANK YOU to our Coalition members – who have almost tripled in the past year and now stand at 74 members strong – for their tireless work advocating for Massachusetts’ children! We have come this far – but our job is not done. The budget will now be sent to the Governor for his signature. The Governor still has the power of the veto. Let’s continue to advocate for stabilizing the workforce and preserving and growing the quality programs we have across our state! BOSTON – As we approach Father’s Day, Massachusetts dads are calling for more investment in early education. Massachusetts Fair Share has been collecting photo petitions from people across Massachusetts to #SupportEarlyEd. As state leaders work to reconcile the differences between the House and Senate budgets, Massachusetts Fair Share, along with the Put MA Kids First Coalition, is supporting the higher level of funding in two critical early education line items. The Early Education and Rate Reserve ($15M, 1599-0042), which supports early educators, and Early Education Quality Improvement ($2M, 3000-1020), which helps early education programs raise and maintain their level of quality in the state’s quality rating system. But all of the critical increases to early education are endangered by the current budget shortfall. Preserve House Funding Levels for Early Ed! A big thank you to Speaker DeLeo for championing early education and care in Friday’s Boston Globe article! Over the next two weeks, please advocate for the Coalition’s two budget priorities by encouraging educators, parents, and others to sign the letter below, which asks their state Rep. or Senator to urge the Conference Committee to preserve House funding levels for the rate reserve (1599-0042) and for direct program grants for quality (3000-1020). A reminder to please call/write your legislators today to send a message to the Conference Committee to preserve House level funding for the early education and school-age rate reserve ($15M, 1599-0042) and direct program grants for quality ($2M, 3000-1020)! A PDF of the letter below can be found here! THANK YOU to all the Members of the House of Representatives, particularly Speaker DeLeo, Chairman Dempsey, and Chairwoman Peisch for championing quality in early education and care and out-of-school time (EEC-OST) programs across Massachusetts in the House the FY’17 Budget recommendations. Would enable more early education and care programs to improve their quality. In FY’16, 586 programs applied for funding and only 196 were funded. Protect critical investments for quality early education and care programs for our infants and toddlers and the stability of the fragile EEC-OST workforce in the Conference Committee! Putting early education front and center in Mass. “House Speaker Bob DeLeo is done talking about the value of preschool education. It’s time to get it right in Massachusetts. This week DeLeo began meeting with a group of business leaders to develop a plan on how the state could increase not only access to early education but improve quality. His goal: Come up with a set of recommendations that can be turned into legislation or new programs by the next budget cycle. More than expanding charter schools, reforming preschool could be one of the most important education initiatives for the Commonwealth in decades. Study after study indicates that kids who are schooled at an early age graduate from high school and college at higher rates than those who do not. They are also less likely to abuse drugs, end up in jail, or rely on public assistance. Yet in the fight for scarce public dollars, early education has been low on the priority list, overshadowed by the needs in K-12 and public colleges. And read Bessie Tartt Wilson Initiative for Children’s Commentary here! PMKF Action Alert: Contact Your Senators Now! Find your local legislator here! Help the Put MA Kids First coalition support and preserve quality in the early education and care and out-of-school time field! Senate Budget Action Alert, 5.20.16. • Supports the early educator workforce – 37% of whom are reliant on some form of public assistance to support their families. The Senate Ways and Means appropriated $10M to the rate reserve. Please ask your Senator to support Amendment 139 sponsored by Senator Moore to increase this amount by an additional $10M. Please ask your Senator to support Amendment 215 sponsored by Senator Forry to specifically earmark $2M in line item 3000-1020 for direct grants to early education and care programs. Please ask your Senator to support these vital budget items. Putting MA Kids First puts the Commonwealth’s economic, social, and innovative future first!